In the second part of our video series “Dressage explained” we look at a stretching outline. Why is it so important and what must a rider do in order to achieve it? Riding with a stretching outline is one of the most important parts in successfully educating a horse. It helps the young or uneducated horse to carry the rider more easily and build the correct muscles. For the more advanced horse it provides an opportunity between the intensive phases of work to relax. But what does a correct stretching outline look like? What happens physically? What must a rider do to achieve this and when should one ask for it? Author, trainer, and clinician Mark Russell incorporates the in-hand exercises developed by the classical masters into his own training program to relax, supple, and strengthen the horse in educated postures. He demonstrates the techniques he uses to teach the horse to respond with lightness to the aids. His methods are accessible to riders from all disciplines. 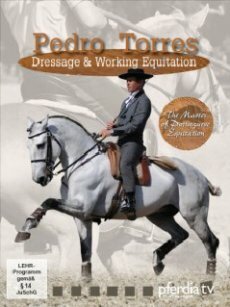 The creator of the Masterson Method brings you a new instructional DVD that addresses the unique expectations and demands put on the horse’s physiology as he moves up through the different levels and movements of dressage. Here you discover what goes on with the horse’s body during dressage training, enabling riders and trainers to recognize when a horse may be developing physiological issues. Specific Masterson Method bodywork techniques are shared to help riders meet the unique demands on the dressage horse. Philippe Karl now presents his Ecole de Legerete organisation chart. His training philosophy is inspired by the most accomplished masters la Gueriniere, Baucher, Beudant, L’Hotte and founded on an absolute respect of the horse. Basic knowledge of anatomy, motion, balance and psychology enables the rider to get the best from any horse without using force or constraint systems (side reins, running reins etc). .Philippe Karls philosophy for his training methods are based on understanding the physical and mental conditions of the horse, the ease of the aids and the horses movements. It is fundamental that the aids are taught clearly before the horse begins to do any gymnastic work. Complete flexibility of the neck is essential for the neck extension and flexion of the poll. An introduction to training on two tracks completes the first part of this schooling series. Collection makes the horse look like a “classical dancer”, that’s Philippe Karls aim. In this third step of training Philippe uses the gymnastic exercises as previously demonstrated, to improve collection. Passage, pirouette and piaffe are the peaks of collection. A pirouette is the utmost rotation of the horse around its quarters and only a supple and collected horse can manage this air. The Spanish Walk is not only an exercise in preparation for the passage, but also a useful movement to improve the mobility of the shoulder and help further the union between rider and horse. A debate between Philippe Karl and Christoph Hess. 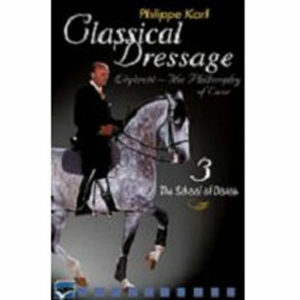 When Philippe Karl’s book ‘Twisted Truths of Modern Dressage’ was published, feelings began to run very high. These two heavy weights of the dressage world met openly and without mincing words to discuss their individual points of view – a somewhat heated debate using actual practical examples of different riders and horses in the riding arena. Organised by Claudia Sanders (Dressage Studies Publisher) with the aim of not only documeting it but also of presenting it in a completely objective manner. A riveting and interesting watch. 130mins – double sided DVD. 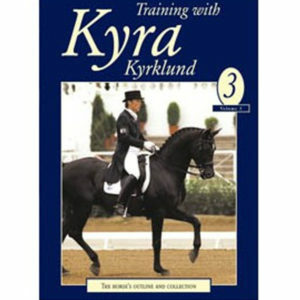 Flying changes are the topic of this final volume of the Training with Kyra Kyrklund DVD series. Kyra explains how, why and when to ask for a change; what to expect and what to do if something goes wrong or nothing happens at all! She starts with simple sequences through walk and builds up step by step to one tempi changes. This fascinating programme should answer all your questions on the problems of changes of leg at the canter from the simple change through to the sequences of tempi changes. Running time approxﾠ30 mins. 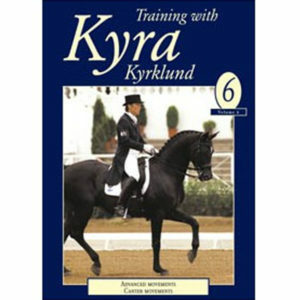 The fifth volume of the Training with Kyra series is the culmination of the “start, stop, turn” formula found in the earlier programmes of the Training with Kyra Kyrklund DVD series. The three peaks of collection pirouette, passage and piaffe are clearly shown to be the fruits of a logical and natural dressage training programme. In volume 4 of the of Training with Kyra series any problems you may have with lateral movements will, hopefully, be untangled. ﾠLeg yielding, shoulder-in, renvers, travers and half-pass are all covered inﾠKyra Kyrklund’sﾠstraightforward and analytical way. The subtle difference between bending and flexingﾠalso covered makes interesting viewing. “Balance” is the key word of this second volume from the six part series ‘Training with Kyra’ . The riders position is analysed in detail both at the halt and when in motion. Basic rider faults commonly seen are demonstrated and the relationship between the rider’s balance and their instant effect on the horse are examined. With Kyra’s help you can improve your performance immeasurably. Approx running time 25/30 mins. Volume 3 of, the 6 part series ﾓTraining with Kyraﾔ, discusses How to start – How to stop – How to turn – How to get a horse on the bit – How the horse should stretch down – How to get the horse’s head up again.ﾠAnd discusses the need for collection and what the term means in Kyra’s well known straight forward and logical way. Kyra answers those questions which every rider would like to ask,ﾠin an involving and memorable manner. Approx. run time 25/30 mins.